S Varalakshmi of CPI(M), the first woman candidate from a national party for this seat, explains how she is fighting against caste politics and neglect. The parliamentary constituency of Chikkaballapur is a dry land facing severe water crisis. As the constituency goes to poll for the 2019 General Elections on 18 April, a solution to the water problems is the primary demand in the constituency. This time, the constituency will also see the first woman candidate from a national party contest from here — S Varalakshmi of the Communist Party of India (Marxist). An industrial worker who has been a full-time party worker since 1994, S Varalakshmi is the leader of the Centre of Indian Trade Unions (CITU). She spearheaded the the struggles of the anganwadi and mid-day meal workers in Bengaluru. Speaking to Newsclick, Varalakshmi noted that the presence of women in the male-dominated Karnataka politics remained meagre, as male politicians look down upon and underestimate the women candidates. “The BJP talks so much about their grand plans for women empowerment, how many of their candidates in the state are women? Only one,” she said. Former Chief Minister Veerappa Moily (19 Nov 1992–11 Dec 1994) of the Congress, who is also former Union Minister (Petroleum and Natural Gas; Corporate Affairs; and Power) was elected as Member of Parliament from Chikkaballapur constituency in the previous Lok Sabha elections of 2014. He is contesting yet again from the same constituency. BN Bache Gowda of the BJP, also former labour minister during the BS Yeddyurappa-led BJP government in the state, is also contesting from this constituency. Moily was elected in 2014 because of his ambitious, and what Varalakshmi calls, an “unscientific” solution to the water problem: he had proposed a project called the Yettinahole project. The project aimed at harnessing the west-flowing Yettinahole, Kadumane Hole, Kerihole and Hongadahalla originating in the upper reaches of the Western Ghats near Sakleshpur. It has been proposed that about 24.01 TMC of water be diverted from these streams during the monsoon period from June to October. The excess flow is to be diverted by constructing 8 weirs restricting the height to avoid any submergence. Moily laid a foundation stone for this project and work has already begun. However, this project is infested with corruption and substandard work so far. Newsclick (NC): How is the atmosphere in Karnataka and in Chikkaballapur constituency in particular, with regard to the Lok Sabha elections? S Varalakshmi (SV): It is a tough fight for the BJP in Karnataka since the Congress and the Janata Dal (Secular), the two political parties in the state are together. However, this unity is only superficial as the local leaders in these parties are not together. The reason for this is, in rural areas, the competition in all the local body elections is between these two parties. This is tricky because we have these local body elections coming up immediately after the general elections and 3 per cent of the municipal bodies will be going to polls. For example, if the Congress local leaders campaign now for the JDS candidates, it is going to be a problem for them in these local body elections and vice versa. Other than this, I don’t think the Congress-JD(S) coalition government thought through the fielding of their candidates tactfully. I say this because in many place it has so happened that the constituencies in which the Congress has sitting representatives, they have fielded JD(S) candidates: for example, Tumkur. The sitting MP from Tumkur is Muddahanumegowda SP of Congress, but it is HD Devegowda of JD(S) who will be contesting from the constituency. Another mistake is that the JD(S) has ended up drawing their inexperienced younger family members into politics and this has enraged a lot of progressive organisations. Several such organisations in Hassan, where Prajwal Revanna (son of HD Revanna, brother of the CM and sitting MLA), having no other option have decided to support BJP. This is very unfortunate. These organisations feel there is no alternative in the region as the Congress and JD (S) have been rival parties in the region. The former Congress MLA from the region has decided to contest from the BJP seat because he was not happy with the coalition and they prefer supporting this candidate and not the novice Prajwal Revanna of JD(S). I feel these mistakes of the JD(S) and the Congress might give way to the BJP in a few constituencies, but it is not going to be simple for the BJP in the state. When we come to our constituency, the sitting MP is from the Congress, 5 MLAs are from Congress, 2 MLAs from JD(S) and 1 from BJP from Yelahanka, which is part of the metropolitan. The other parts in the constituency are rural and the Congress has a strong presence here, so much so that it is believed anyone who would stand from the Congress would win. The reason for this is, the constituency is extremely backward, it has a sizeable minority population, and is suffering from extreme drought-like situations, due to the persistent water problems. However, people in the region are not happy with Moily from the Congress, who has done nothing in the past ten years. For example, this Lok Sabha constituency has got three districts, Bengaluru Rural, some parts of Bengaluru Urban and Chikkaballapur. Bengaluru Rural has a severe water problem. It is so bad that even if one digs 1,300 ft, one cannot find underground water. The water available has high levels of fluoride. This is a serious problem. According to a report, this place would soon be a drought-hit, barren area due to unavailability of water and the geographical location of the region. Despite of such a grave condition, none of the BJP and Congress governments have done anything to solve this problem. It was the CPI(M) which recognised the seriousness of the issue for the first time. Sree Rama Reddy of the CPI(M), the former MLA from the region had taken this issue up in 2002 when SM Krishna was Chief Minister. GS Paramashivaiah, an irrigation expert and Chief Engineer, had studied the issue and submitted a report. 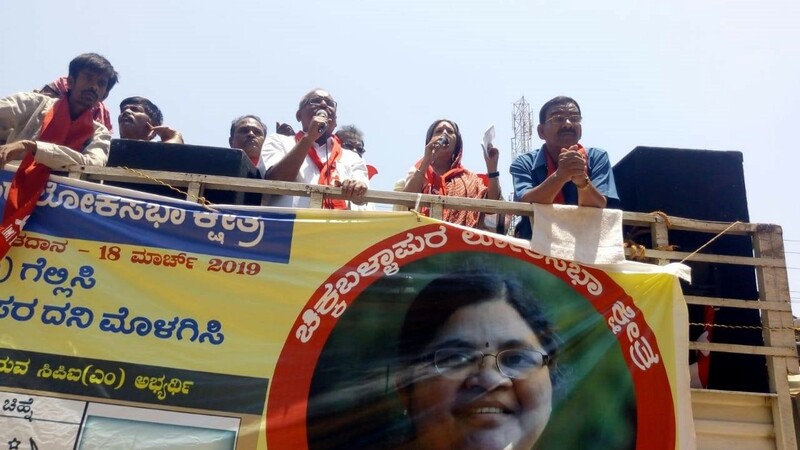 Reddy had mobilised thousands of people and had marched from Chikkaballapur to Bengaluru. The government had even ordered for a committee to study this issue, but nothing was done. When Moily was a cabinet minister in UPA-I, we had demanded for the Paramashivaiah report to be implied to solve the problem permanently. Also Read: Karnataka: Can Lies And Communal Propaganda Win BJP the Elections? NC: What did the Paramashivaiah report say? The government has already released Rs 1,300 crore for the project and the money is being wasted in setting up of dysfunctional pipes. There are reports saying these pipes are all rusted and this project can provide water only for drinking and not for agriculture and livestock rearing. So our stand is that Yettinahole project is of no use. Nc: What is the situation in the semi-urban areas in this constituency? SV: Devanahalli and other regions surrounding it do not have clean drinking water. All of them buy the bottled water and hence, this has become a business around this region. The Congress has proposed an absurd solution to resolve this problem. They have come up with a project called HC Valley and KC Valley, which is bringing together of the lakes in Hebbal and Koramangala, treating the water (as it mostly is drainage water) and supplying it as drinking water in this region. This is horrible as the water is supposed to be filtered in three phases, but they are filtering it only in two phases. Various organisations had approached the Supreme Court, but I hear the Court has given a green signal to this project recently and now people here are getting this water for drinking. But we, the CPI(M), are opposing this move and we have made this our key issue in the current elections. NC: What are the other issues the party is concentrating on? SV: It is been 11 years since Chikkaballapur became a separate district. Earlier, it was with Kolar. There are no development projects here: no medical college, no engineering colleges or no degree colleges at all. This is a dark face of this region. This is one of the issues we are taking up. The rural regions because of the drought have the highest levels of migration to the urban areas. As I have already explained, this issue has to be addressed seriously. Another grave matter is of the local farmers in the Bengaluru rural region, they mostly grow vegetable and fruits but they get no good prices from the market. We are taking this issue up by demanding agro-based industries. NC: Finally, what according to you, is the basis on which the people vote? SV: This is a very tricky question. Here, a party and its ideology do not seem to matter so much. It could be the person who is contesting. No doubt it has been a trend in the state that people voted based on the caste of the candidate, and the BJP is trying its best to mobilise people based on caste. Their candidate Bache Gowda, for example, is not a revered leader in the area. He was an infamous labour minister in the state government during the BJP government. So it is not possible that people will vote for him only because he belongs to the Vokkaliga caste. The BJP is trying to create a caste-based consciousness among people: they are trying to make people believe that if they vote for people of their caste, the elected leader would work for them. That is not going to work. Also Read: Karnataka to be Gujarat of the South?